On 9 July 1982, thirty years ago today, Walt Disney’s “Tron” was released in about 1,100 cinemas in the United States and Canada. The groundbreaking though unsuccessful film was a visual and aural delight and was nominated for two Academy Awards: Sound and Costume Design. More amazing than the film’s amazing visual effects is trying to figure out why the film was not nominated for a Visual Effects Oscar! Of note to large-format film enthusiasts is that “Tron” was produced in a mixture of 5/65 and 8/35 formats. 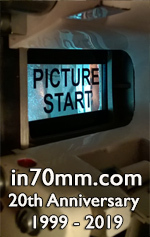 Disney struck about forty high-quality 70-millimeter prints for distribution in North America, and a list of the venues in which the 70mm six-track version were booked is provided below. Some may find it surprising the number of cinemas in major markets denied an opportunity to showcase “Tron” in the best presentation manner available at the time because most of the 70mm-equipped cinemas were showcasing other 70mm product that beat “Tron” to market (“E.T.”, “Star Trek II: The Wrath of Khan”, “Annie”, etc.). Cinemas in some major cities absent from the list of initial 70mm bookings did, however, screen a 70mm print in the autumn of 1982 and/or spring of 1983 when Disney re-issued the film with the hope it might find an audience during a less-crowded moviegoing season. So do I think “Tron” is a good movie? After 30 years I still can’t decide! One thing is certain: the film was ahead of its time due to the innovative use of computer graphics. Its influence can be observed in countless movies, television programs and video games. I think anyone working in the film, computer and video-game industries owes a debt of gratitude to “Tron” and its talented production crew. “Tron” memories… As a teenager, I saw “Tron” in the summer of ’82 at the Barstow Twin in Barstow, California. I had looked forward to seeing it thanks to the arcade game and articles in magazines such as Starlog, but upon seeing it I recall having a difficult time keeping the characters straight or understanding the computer terminology and thinking the movie was not as enjoyable as the arcade game. What I remember most was on the way out of the cinema, enthusiastically spotting the one-sheet for that summer’s re-issue of my then-favorite movie, “Star Wars”, which included a banner in the corner of the poster promising the first glimpse of footage, in the form of a coming attractions trailer, for "Return of the Jedi" (then known as “Revenge of the Jedi”), due for release the following year. I would see “Star Wars” several (more) times during that summer re-issue, and “Tron” was quickly forgotten. Over the years, though, thanks to the fantastic Special Edition LaserDisc (and subsequent DVD and Blu-ray) and the new 70mm print struck in 1999 that made the rounds, I’ve come to appreciate “Tron” and think it deserves some recognition on the 30th anniversary of its release. Is "Tron" filmed in 65mm? "The Making of Tron: How Tron Changed Visual Effects and Disney Forever"
The following is a reference / historical listing of the 70-millimeter presentations of “Tron” in North America. The film’s 70mm prints consisted of full-frame imagery sourced from Super Panavision and VistaVision. The audio was Six-Track Dolby Stereo. “Tron” was among eighteen confirmed first-run films released in 1982 with 70mm prints for selected engagements. The Lisberger-Kushner production and Buena Vista release — directed by Steven Lisberger and starring Jeff Bridges, David Warner, Bruce Boxleitner, Cindy Morgan and Barnard Hughes — opened July 9th. The world premiere of “Tron” was held July 6th at the Walt Disney Studios in Burbank, California. As well, an invitational preview was held July 8th at the State in New York. A trailer for “Tex” and an EPCOT promo circulated with the “Tron” prints and which the distributor recommended be screened with the presentation. Note that some of the presentations included in this listing were presented in 35mm during the latter week(s) of engagement due to print damage and the distributor’s unwillingness to supply a 70mm replacement print or because the booking was moved to a smaller, 35mm-only auditorium within a multiplex. As well, the reverse may have been true in some cases whereas a booking began with a 35mm print because the lab was unable to complete the 70mm print order in time for an opening-day delivery or the exhibitor negotiated a mid-run switch to 70mm. In these cases, the 35mm portion of the engagement has been included in the duration figure. The information in this article was principally referenced from film industry trade publications and regional newspaper promotion, with thanks to Don Beelik, William Kallay, Steve Kraus, Bill Kretzel, Mark Lensenmayer, Stan Malone, Monty Marin, John Stewart and Sean Weitzel, and an extra special thank-you to all of the librarians who helped with this project.